The two chief executives of Fannie Mae and Freddie Mac could get paid as much as $6 million for 2009, despite the companies' dismal performances this year which cost taxpayers more than $100 billion. Fannie's CEO, Michael Williams, and Freddie CEO Charles "Ed" Haldeman Jr. each will receive $900,000 in salary, $3.1 million in deferred payments next year and another $2 million if they meet certain performance goals, according to filings with the Securities and Exchange Commission on Thursday. The pay packages were approved by the Treasury Department and the Federal Housing Finance Agency, which regulates Fannie and Freddie. That compares to $10.2 million former Fannie CEO Daniel Mudd received and $13.1 million former Freddie CEO Richard Syron pocketed in 2008. Both execs were ousted when federal regulators seized the companies in September 2008. In September, the federal government blocked exit packages for the pair worth up to $24 million. Since then, Fannie and Freddie have needed $111 billion in taxpayer money to stay afloat, one of the most expensive aftershocks of the financial crisis. News of the chief executives' pay could spark new criticism about the government's numerous bailouts. In an apparently unrelated move Thursday, the Obama administration said it is removing the $400 billion cap on bailout support to Fannie and Freddie. Treasury Department officials said the cap will be replaced with a flexible formula to ensure the companies can stand behind the billions of dollars in mortgage-backed securities they sell to investors. In August, the administration projected the cost for rescuing Fannie and Freddie would total $170 billion. While most analysts believe the companies are unlikely to use the full $400 billion, the administration decided to remove the cap to eliminate any doubts. "The amendments to these agreements announced today should leave no uncertainty about the Treasury's commitment to support these firms as they continue to play a vital role in the housing market during the current crisis," Treasury said in a statement. Public anger over Wall Street pay boiled over earlier this year. In response, the Obama administration imposed pay curbs on banks that received government bailouts. All the major banks have since repaid their federal money, largely to escape caps on executive pay. Former Bank of America Corp. CEO Ken Lewis, for example, agreed to forgo his salary and bonus this year under pressure from the government. Last year, he pocketed more than $9 million in total compensation. Bank of America received $45 billion in government assistance, which it has since repaid. Freddie Mac hired Haldeman, a former mutual fund executive, in July. At the time, the company disclosed his annual salary of $900,000 but did not disclose other incentive payments. In September, the company hired a new chief financial officer, Ross Kari, and said his pay package would be worth up to $5.5 million. Williams, formerly Fannie Mae's chief operating officer, took over as CEO in April after the first government-appointed CEO, Herbert Allison, took a job at the Treasury Department. Williams earned a base salary of $676,000 last year, plus a retention award of $260,000. Fannie Mae and Freddie Mac provide vital liquidity to the mortgage industry by purchasing home loans from lenders and selling them to investors. Together, they own or guarantee almost 31 million home loans worth about $5.5 trillion. That's about half of all mortgages. Without government aid, the firms could have gone broke, leaving millions of people unable to get a mortgage. And most experts say the price tag for the bailouts will rise and complicate the government's exit strategy. Though the Obama administration has yet to divulge its long-term plans for the two companies, they are unlikely to return to their former power and influence. Barclays Capital predicts the companies will need anywhere from $230 billion to $300 billion out of a potential $400 billion lifeline, which the Obama administration expanded from the original $200 billion set last fall. Most analysts don't expect the money to be returned anytime soon, if ever. 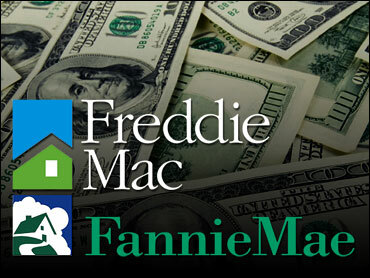 Washington-based Fannie Mae was created in 1938 in the aftermath of the Great Depression. It was privatized 30 years later to limit budget deficits during the Vietnam War. In 1970, the government formed its sibling and competitor McLean, Va.-based Freddie Mac.